The Capcom Pad Soldier MD is a third-party controller for the Sega Mega Drive (its American Genesis counterpart is known as Capcom Pad Soldier GS and alternately the Super Capcom Pad GS), designed by ASCII for Capcom. 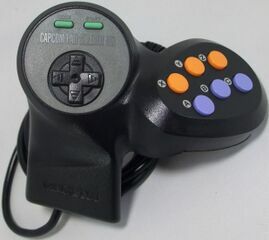 It is an oddly-shaped six-button fighting controller, and one of three variants released by the two companies during the early 1990s (the others being the "Capcom Pad Soldier" for the SNES, and "REAL Pad Soldier" for the 3DO (the latter handled solely by ASCII)). The Mega Drive version has a rounded D-Pad and orange/purple face buttons. The idea behind the design was that you could use three fingers for the 6 action buttons, much like an arcade stick, but the convenience of a gamepad. The left side is contoured so your hand can maintain a sturdy grip, and the buttons are off-set to reduce strain on your right wrist. You can still use your right thumb, and it feels very natural in your hands.